HABITAT: Scheffleras are usually 2 to 3 feet tall when sold, and grow to 8 feet or more in height. It is possible to prune them to maintain a lower height. They are grown for the attractive patterns formed by their leaves, and for their tall and shrubby form. Leaves are composed of oval leaflets arranged in an umbrella spoke pattern. Young plants have small leaves with only three to five leaflets. 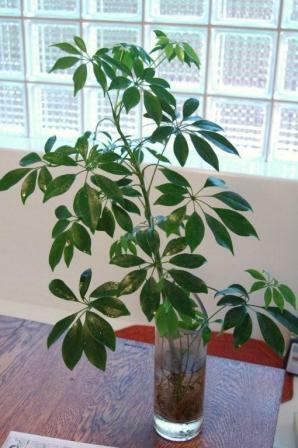 In older plants, the leaves are dramatically larger, eventually developing up to 12 leaflets, each up to 12 inches long. PROBLEMS: Diseases are rarely a big problem. Too much or too little water, plus insects and mites, are the main problems. Mealybugs, scale insects and mites are common pests. Root rot can result from a soil mix that does not drain quickly or overly frequent watering. Dead areas form on leaves several days after exposure to excessive cold. Temperatures above 50°F are best. Do not place plants near air conditioning vents. Low light can cause leaf yellowing with spindly, weak stems. Leaf drop can be caused by excessive watering, by low humidity or by chilling. CULTURE: Scheffleras prefer medium to bright light, but are tolerant of fairly low light levels. Scheffleras prefer day temperatures between 65 - 75°F. Nighttime temperatures should remain above 60°F. Keep plants away from heat vents, radiators, open windows and air conditioners. Hot or cold drafts will damage plants. Fertilize scheffleras regularly with a gentle organic fertilizer. Plants growing in reduced light will need less frequent fertilization than plants growing in bright light. Coffee grounds make an excellent fertilizer for this plant. Repot overcrowded plants at any season, using an organic potting soil. To keep plants small, prune just above a leaf. Propagation is by seed, cuttings and air layering.